Where to find 28 of the area's outdoor yoga sessions, series, and pop-ups. By Bailey King·	 5/16/2018, 8:00 a.m.
Is there anything like doing yoga in the sunshine? Or better yet, in a warm breeze? 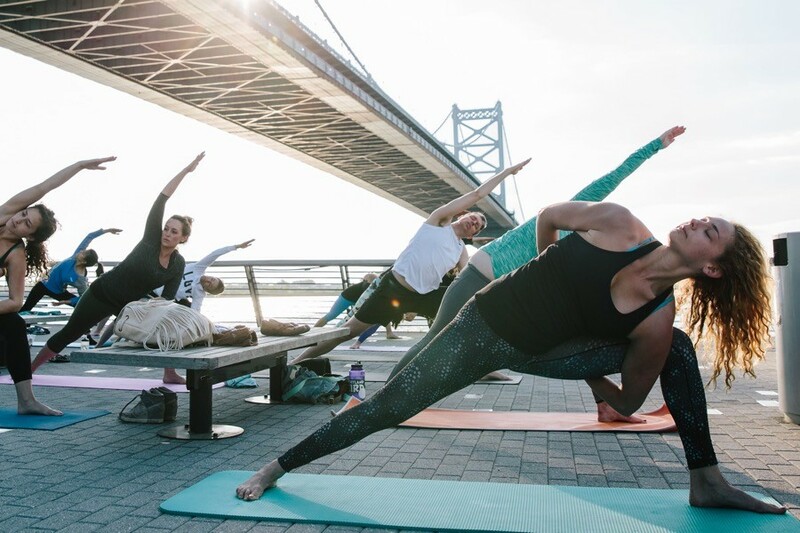 We think not, and that’s why spring and summer in Philadelphia are the best seasons for yoga because there are TONS of outdoor options. Below, you’ll find 28 outdoor yoga classes, series, and pop-ups happening in Philadelphia, the ‘burbs, and South Jersey. Some are free, some are cheap, some include wine — read on to find your new favorite warm-weather activity. Note: All of these classes are BYO-mat unless otherwise noted. Where: Race Street and North Columbus Boulevard. When: Monday through Thursday at 7 a.m. and 6 p.m., Fridays at 7 a.m., Saturdays and Sundays at 9:30 a.m., plus select Twilight Yoga dates. From late spring to early fall, Race Street Pier offers daily yoga classes open to all levels. Should it rain on the parade, the weekend and evening classes will be relocated to Functionally Fit at 110 N. 2nd Street. Free; donations welcome. Where: 25th and Locust Streets, Schuylkill Banks. When: Saturdays and Sundays at 11 a.m., Tuesdays and Thursdays at 6 p.m. Throughout the summer, donation-based yoga classes are hosted on a grassy waterfront patch on the Schuylkill. All donations go to the yoga teachers and the the Yoga on the Banks organization. Pay what you wish. Where: East Moyamensing Avenue and Morris Streets, Dickinson Square. When: Every Sunday (weather permitting) at 9 a.m.
Yoga at the Market offers open-air classes at the Dickinson Square farmers’ markets. After you say Namaste, you can hit up local vendors for some fresh produce. You’ll surely leave feeling refreshed and healthful. Donation-based; Pay what you wish. Where: 121 North Columbus Boulevard. When: Schedule varies; you can check times here. Combine stand-up paddle boarding with yoga for the ultimate test of balance in this outdoor yoga series. Paddle boards are provided, but you might want to trade in your yoga pants for a pair of board shorts for this class. $38 per class. Where: A different Philadelphia park each week; check the schedule here for location details. When: Thursdays at 6 p.m. through September 27. This series combines happy hour with yoga — yes, bites and beverages are available after yoga! Roots2Rise and Parks on Tap are giving you a yoga tour of some of Philly’s greatest parks. Use this as an excuse to explore Philly’s nature through yoga and get together with friends over post-workout drinks. $10 suggested donation per class. Here’s another series brought to you by Roots2Rise. Feel especially centered in your bridge pose while balancing on the Manayunk Bridge. All donations benefit Roots2Rise. $5 suggested donation. When: Select days and times on a pop-up basis; check their Facebook to stay up to date on the whereabouts of the pop-up classes. As a part of Honeygrow’s hgAthletics summer workout series, your favorite salad joint will be bringing you cheap yoga at various outdoor locations. On Tuesday, June 19, you can find them at Yards Brewery at 6:30 p.m. After the classes, you get 20 percent off a stir fry or salad. $5. Where: Anne d’Harnoncourt Sculpture Garden, 2600 Benjamin Franklin Parkway. When: Wednesdays at 6 and 7 p.m.
After you’re done perusing the collections, meditate on the inspiring art with a complimentary yoga class at the Philadelphia Museum of Art. Free after pay-what-you-want Art Museum admission. Where: 1001 North Second Street, Northern Liberties. When: Saturdays at 8:30 a.m. and Sundays at 6 p.m.
Dhyana Yoga Northern Liberties is making the Piazza their own personal outdoor studio. With two free classes weekly, you have no reason not to get your stretch on in the sunshine. Free. Where: The Deck at Moshulu, 401 South Colombus Boulevard. When: Sundays at 10 a.m. starting May 27th. These classes will get you your perfect work-hard, play-hard combo. Start out the morning with yoga then stick around for boozy brunch. 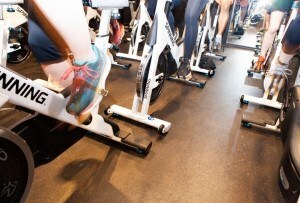 $10 for yoga and 15 percent off brunch. Where: Laurel Hill Cemetery, 3822 Ridge Avenue. When: June 2, July 7, August 4, and September 1 at 10 a.m. Okay, this might sound a little, well, creepy. But local instructor Emily Tara Sabalbaro, who teaches at Mindful Elephant, OpenBox Athletics, and Philly Dance Fitness, is sure to give a great class. Plus, Laurel Hill Cemetery is a beautiful backdrop for your downward dog — though your Savasana might just feel a little too real. $15. Where: Bok Bar, 1901 South 9th Street. When: The second and fourth Tuesday of the month (all summer long!) at 6:30 p.m.
Watch the sunset on the roof of Bok and get into the groove with some upbeat yoga that benefits a different local non-profit every month. You’ll need to sign up ahead of time here. $10 suggested donation. When: The last Sunday of every month, starting June 24, at 11 a.m. This fun monthly event, led by Katie Gould of KG Strong, combines two things you’re probably already doing on any given Sunday morning (Read: yoga and brunch) so you might as well do them together on Bok’s b-e-a-utiful rooftop. $25. When: Wednesdays at 6 p.m. and Thursdays at 5:15 p.m.
You can’t beat a good bend in the grass in South Philly! This Navy Yard pop-up is ever-so slightly wandering: on Wednesdays, classes are in Crescent Park and on Thursdays, they’re at Central Green. Free. Who needs happy hour plans when you can spend that time stretching and meditation among the trees with a gentle breeze? Join the folks of Peace at the Park for a weekly yoga and meditation session in Washington Square Park. $5 to $10 suggested donation. When: Daily classes offered from June 16 to September 23. Schedule varies; you can check here. Combine stand-up paddleboarding with yoga — featuring a ton of fun themes, styles and tunes — for the ultimate test of balance in this outdoor yoga series. Paddleboards are provided, but you might want to trade in your yoga pants for a pair of board shorts for this class. $38 per class. Join Ashley Tryba for a session of open-air yoga sponsored by Three Queens Yoga. Stay and chat with the folks of Bennett Compost and peruse the vintage treasures a la Sweet Marie Vintage. Free. Where: 115 Village Drive, King of Prussia. When: Tuesdays from 5:30 p.m. in June and July (excluding July 3). King of Prussia’s Stillpoint Yoga Studio is providing free yoga classes in front of Fogo de Chao starting the first Tuesday in June. After your yoga class, treat yourself and indulge in KOP’s shopping district. Free. Where: 500 West Germantown Pike, Plymouth Meeting. When: Saturdays and Sundays at 9 a.m. through September 3. Get your grocery shopping and workout done in one fell swoop. Yoga Home is hosting these all-level classes, and you won’t want to miss ’em. $5. Where: 2 Ash Street, Conshohocken. When: Fridays at 5:45 p.m. This Conshohocken hotspot is hosting Sol Yoga for weekly classes in their beer garden. Say namaste with a pint right after class. $5. Join the folks of Local Yoga Cafe for a dose of nature with a side of yoga that will surely heal your mind and your body. $5. When: The schedule varies, keep up to date here. By now, you’ve probably heard of goat yoga. Well, now you can try it in the Philly ‘burbs. Water and Rock Studio has teamed up with Mountain Pride Farm to bring you the goat goodness. Register ahead of time here. $35. Where: 124 Beaver Valley Road, Chadds Ford. When: Select Fridays and Saturdays throughout the summer; see the full schedule here. Yoga in a vineyard? And wine afterwards? Count us in. Enjoy Penns Woods Winery’s summer series of an hour long Vinyasa class followed by a wine tasting. You’ll even get a souvenir wine glass and ten percent off any wine purchase. $35 for yoga and wine tasting. Ocean, Earth, Wind and Fire, a holistic health practice out of Phoenixville is hosting this nature-filled yoga pop-up. Join them for a yoga session and finish up with a walk around the property’s nature trails or a visit to their bird sanctuary. $16. Join the folks of Nectar Yoga Studio for a yoga session in Reservoir Park’s Community Garden on Fillmore Street across from Friendship Field. $10. When: The second Saturday of every month at 10 a.m. and noon. Shake Your Soul — unique yoga practice combines yoga with movement therapy by incorporating elements of Qi Gong and dance — will be taking over the Pennsbury Manor lawn for two sessions once a month. The second session is Shake Your Seat yoga, which is basically chair yoga — a great low-impact option. $10. Where: JFK Boulevard Beach, Sea Isle. When: Mondays, Wednesdays, and Fridays at 7:30 a.m.
Get your toes a little sandy with NJ Beach Yoga‘s morning seaside classes. You won’t have to sign up ahead of time, so if you make a spontaneous trip to the beach, just show up and get into the flow. $10. Where: 30th Street Beach, Avalon. When: Mondays through Saturdays at 8:30 a.m.
Here’s another beach yoga class put on by Island Aerobics. Instead of a mat, the folks at Island Aerobics recommend a beach towel. Just show up at the beach ready for some yoga and pay in cash. $15.